The Polly Morris Band is gaining a reputation in the South of England for skilled musicality combined with comedy. The tag line " Expect the Unexpected" has become linked with this band who have been performing at festivals and writing and performing in sell-out shows in the Bournemouth area for nearly 3 years. 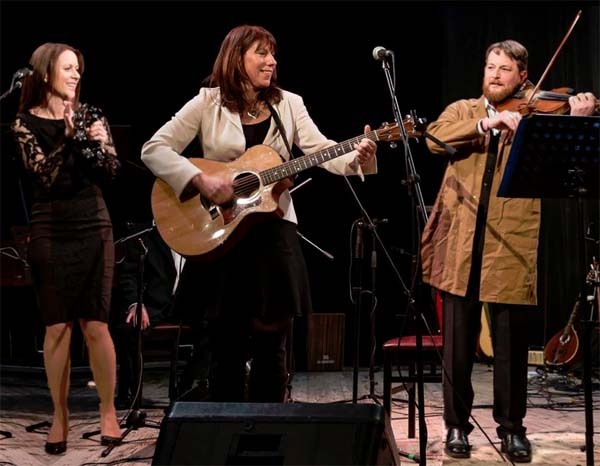 Led by comedy songwriter Polly Morris, The Polly Morris Band comprises vocals, guitar, harmony vocals, fiddle, saxophone, flute, accordion, bass double bass and piano. The musicians in the band are Polly Morris, Mandy Stansfield, Steven Faulkner, Kate Hunter, Brian Harries and Joel Solomons. The Polly Morris Band has been performing at the Shelley Theatre, Boscombe twice a year with original material. These have all been sell-out shows. The most recent one was on Friday, 24th November 2017. They have played at many music venues in and around Dorset including Chaplains, and Mr Kyps. They have played at Charity Events for Mummy's Star, Cancer Research, The Ladybird Unit - Poole Hospital and KIK (Kids In Kailahun) and Teddy Rocks.